SF Taxi Media: Recap of Taxi Advisory Council Meeting, Monday, March 26, 2012. By John Han. Recap of Taxi Advisory Council Meeting, Monday, March 26, 2012. By John Han. At its Monday, March 26, 2012 meeting, the Taxi Advisory Council (TAC) voted to approve a final version of the Medallion Sales Pilot Program Report to be submitted to the MTA Board of Directors. The vote was 13-1, the sole 'no' vote being from Bill Mounsey. Included later in this article is a copy of the Medallion Sales Pilot Program report in its entirety. 18 - Bandit cab drivers cited for operating without a permit. 3 - Broker investigations at three color schemes for managing permits outside the regulated lease arrangements. Jarvis Murray of Taxi Services Staff, who was filling in for Deputy Director Christiane Hayashi as Liaison, said that the MTA has collected $1000 worth of the fines above. That is a low amount considering that some of the fines issued so far have been for as much as $5000 for a single citation. However, Murray said the agency has seen reduced repeat offenders as a result of the citations. Pedicab driver servicing passengers from the Moscone West at last years Oracle Convention. The bike-taxi pedicab industry is seeking to expand its territories beyond just the Embarcadero/Fisherman's wharf area. 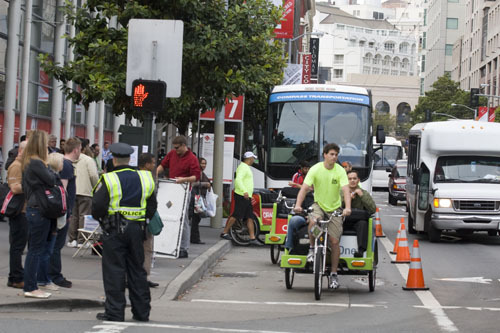 Andrew Watters of Cabrio Taxi, a pedicab company, told the TAC that he is already operating in the Marina District at night, and is hoping to expand into the Mission, SOMA, Lower Haight, and Upper Haight districts, to name a few. We plan to supplement what the taxis are not able to do during peak-demand times. Due to intra-SF culture and geography, we will always cater to a different crowd. We share the same desire to see a reduction in illegal town-cars on the streets. Dealing with the overly-intoxicated, shorter rides, is the clientele we deal with. There was not overwhelming objection from the TAC towards the idea of more pedicabs, given that people might generally take a pedicab for different reasons than they would a taxi. However, council member Tone Lee was adamantly opposed to the idea. Additionally, Watters said his company is working with Cabulous, and that he hopes to service dispatched orders to pick up passengers from their homes. This increased the opposition, the idea of pedicabs servicing dispatch calls. The SFMTA is considering whether to put a taxi stand in front of the Four Seasons Hotel on Market St. between 3rd and 4th Streets. Jarvis Murray of SFMTA Taxi Services Staff says the agency is seeking input from taxi drivers as to whether a taxi stand there would likely get used or not. The SFMTA said it is holding off on updates of regulatory reform for a "few weeks" or "a month". The next TAC meeting is scheduled for April 23, 2012, at 1 pm, at One South Van Ness Ave, Second Floor in the Atrium. There was also some discussion as to whether the TAC should continue much more beyond that date. The taxicab advisory council has spent the last 18 months identifying potential problems and benefits that may arise out of the Medallion Sales Pilot Program (MSPP) and assessing how those have been manifesting. With just under 200 permits sold the industry has realized the impact of medallion sales and we have made significant headway in identifying the changes and recommending solutions for any problems that are beginning to arise. As with any significant shift in business model the industry is going to go through a state of adjustment as it adapts to the new model and its economics. This is being seen as an opportunity to solve some of the challenges that the industry has faced for many years. This report will address the 5 classes of participants in the industry summarizing how each participant has been affected and what recommendations the TAC has decided on as improvements or solutions for each. Almost two years ago, in August of 2010, the SFMTA Taxicab Advisory Council (TAC) was formed to asses and provide recommendations on the Taxicab Medallion Sales Pilot Program. In these 2 years the TAC has seen the impact that a full medallion sales program would have on the industry. We have voted on recommendations for the expansion of medallion sales and summarized those in this document. Permits to operate a taxicab are issued to San Francisco taxicab drivers who have demonstrated being a taxicab driver full time (800 hours or 156 4-hour shifts per year) for 4 out of 5 years prior to applying for their permit. Along with their permit to operate a taxicab the permit holder receives a metallic medallion imprinted with the permit number. This permit number will be the taxicab number and the medallion must be displayed in the taxicab when it is in operation. After the permit holder receives the permit he or she has the option of a taxicab company under which to operate the permit. The majority of permit holders elect to join with an existing company. In this case there are 2 arrangements that a permit holder can agree to with the company. The first is what is called being an “Affiliate”. In this case the permit holder manages their own taxicab independently but rents from the company the use of its colors or trade dress and radio dispatch services. The permit holder is responsible for provisioning a vehicle, equipping it to operate as a taxicab (meter, top light, paint, lettering, in taxi equipment or ITE etc. ), providing adequate automobile liability insurance, worker’s compensation insurance, selecting and hiring drivers for his or her taxicab and adhering to the rules and regulations of taxicab operation set forth by the SFMTA DTS. 1. The lease fee to take the cab out of the yard “Gate”. 2. Bringing the taxicab back fully fueled “Gas”. In the above case the permit holder leases his or her permit to the taxicab company and the company sets a daily operation schedule for the permit leasing it to drivers on a per shift basis. The taxicab company also provides all of the fore mentioned management services and is responsible for adhering to the taxicab rules and regulations. In this situation the permit holder would drive just like any other Gas and Gate driver. Drivers who are not permit holders can work with either the taxicab company or with the permit holder directly (if he or she is an Affiliate). Drivers have two options primarily delineated by the term of their lease of the taxicab. They can either lease it on a per shift basis taking out the cab for one shift or they can lease it on a monthly basis allowing them to operate the vehicle for the entire month. The driver who leases and pays per shift is commonly referred to as a Gas and Gate driver because they are more often than not driving a cab managed as Gas and Gate. The lease on a monthly basis is commonly referred to as a “Long Term Lease”. The driver of a Long Term Lease provides the vehicle, equips it and schedules additional drivers and pays to either the permit holder or the company on a monthly basis rather than a per shift basis. The lease fee for the Long Term Lease driver is discounted because he or she is bearing the cost of the vehicle and its maintenance. The driver’s income is generated from revenue of driving their shifts minus the associated costs. The permit holder’s income sources are from driving their shifts in addition to income from their permit. Permit income is either elimination of paying the gate fee if they manage the permit as an Affiliate or lease fees from the cab company if they lease it to the cab company to manage. The cab company’s income source is from managing permits for permit holders. Medallion holders in the pool were and are still able to opt out of the program. Applications to participate in the pilot program were accepted until May 14, 2010. A temporary window was re-opened in January 2012 to allow for additional permit holders to participate and the age restriction was lowered to 65 years of age or older. Of this group 203 signed up to participate in this program. The medallion applicant waiting list consists of 3029 individuals and is currently closed to additional applications. Of this group, the top 511 on the list have so far been offered an opportunity to participate. Of these, 287 have applied to purchase a medallion. Those toward the top of the list have had to weigh the possible future opportunity of receiving an ‘earned’ or issued medallion when they reach the top of the list against the present value of purchasing a medallion as part of this program. In spite of the fact that cab drivers may have no credit history or a poor credit history, the credit unions have been able to fund loans to almost all applicants. If all potential sellers are qualified and participate, 203 medallions will have passed to the medallion applicant waiting list. To date $18,600,000 in revenue has been generated of which $16,200,000 has gone to the SFMTA, and $2,400,000 to the drivers’ fund. 1. A change in the leasing arrangements from Gas & Gates operation to Affiliate operation. 2. Abrupt movement of taxicab permits between companies. The type of leasing arrangement that a taxicab permit is operated with significantly impacts the companies and the industry. The proliferation of company managed Gas and Gates medallion provides profit for the taxicab companies and sustains their viability. Taxicab companies facilitate provisioning of vehicles and taxi equipment, adherence to vehicle standards, insurance coverage for both automobile and worker’s compensation sufficient for any possible losses that may occur, call center services, dispatch services, lost and found services, driver screening and driver training among others. Most importantly by aggregating all of these functions taxicab companies limit the points of contact for SFMTA to enforce regulations from several thousand points to only tens of points. In the Gas and Gates arrangement there is a greater level of control over the service that is provided and reduced regulatory effort when enforcing the regulations because one cab company is regulated rather than individually regulating the tens or hundreds of cabs and drivers under that company. Under the Affiliate arrangement the permit holder is in control of what type of vehicle is put into service, how it is maintained, the quality of drivers and the driver’s schedules. The pilot program is causing a transition to Affiliate operation from Gas and Gates in the industry for two main reasons. First, the buyers under the pilot program are taking on the most profitable arrangements possible to effectuate repayment of their loans. Second, many of the buyers are younger and want to maximize their earning potential so they operate as an Affiliate. They will work more shifts than are needed to satisfy their driving requirement leaves less shifts available for current drivers. Older permit holders tend to lease their permits to the taxicab companies and only drive a smaller number of shifts to satisfy their driving requirement. As older permit holders are being replaced with younger ones we are seeing an overall trend of less shifts available for drivers in the industry. Additionally DTS reports that purchased medallions are being operated roughly 57% Affiliate and 43% Gas and Gate. Small percentages select Gas and Gate as a preference because they do not want the hassle of running a business or for other various reasons. So of the 43% operated as Gas and Gates nearly all were operated so because of a requirement by the lender to do so when taking advantage of the buyer assistance program. If the pilot program is expanded to all permits in the industry it is expected that there will be a mass change of permits from Gas and Gates operation to Affiliate operation magnifying the concerns of the cab companies’ viability and increased regulatory efforts. With permits moving from company management to permit holder management a tendency has been observed to introduce new inexperienced drivers into the industry and experienced professional drivers who have been driving for several years with cab companies are finding their shifts being reduced. There is a concern that the level of service provided to the public will be negatively impacted as well as a shift in the focus of the cab companies from providing proper service to maintaining viability. The other less concerning phenomenon that is being observed is permits moving from one company to another based on the desires of the buyers. The DTS staff has been doing a very good job of matching permit sellers with permit buyers to mitigate a mass migration of permits from one company to another. This is a much lighter concern and does not warrant any solutions now but we feel it should be monitored going forward. 1. A reduction in availability of shifts for Gas and Gate drivers. 2. Slower movement of the taxicab medallion waiting list. The loss of shifts is directly tied to the transition of medallion operation from companies managing them as Gas and Gates operation to Affiliate operation. What has been observed is that the medallion buyers are not employing the drivers who drove the cab when the company managed it as a Gas and Gate. Rather they are bringing in new drivers leaving the Gas and Gate drivers to look for work with other companies or wait until another Gas and Gate permit replaces the one that they used to drive. Any steps taken toward the preservation of medallions being operated as Gas and Gate will help Gas and Gate drivers preserve their jobs. The slowed distribution of earned permits to the waitlist is attributed to the fact that permits that would’ve normally been returned to be distributed to the waitlist as earned permits are being sold. The term “earned” permit refers to permits which are not sold to drivers, but are earned through completion of a driving requirement. The current pilot program policy on earned permit distribution is in section 1116 (e) of the vehicle code, “As part of the Taxi Medallion Sales Pilot Program, the SFMTA may sell up to 60 Medallions that have been returned to the SFMTA for any reason to Qualified Purchasers at the Medallion Sale Price.” The policy is for every one of these permits that is sold, one is distributed to the wait list as an earned permit. This effectively is cutting in half the permits that are distributed to the wait list and is slowing the advancement of individuals on the waitlist. Individuals on the waiting list are having two very different experiences. Some who are further down the list are taking advantage of the opportunity to purchase a permit rather than waiting to receive it for free. Those who are closer to the front of the list, roughly the top 300 names, have seen a slowdown of permit distribution and a correlated slowdown of their advancement to the top of the list. These individuals are at times faced with the dilemma of deciding whether to purchase their permit and take on the debt or to wait and earn it as initially anticipated. The uncertainty is caused by the reduced distribution of medallions to the waiting list and what will happen with the waiting list if medallion sales continue after the MSPP. The fear is that if all taxicab permits are allowed to be sold there will be no medallions remaining to distribute to the individuals on the waiting list. At a certain age it is not financially feasible to purchase a medallion, so if all medallions become transferable, many veteran drivers would simply never attain a permit. The slowed distribution of permits to the waiting list is an issue that all members of the council feel strongly about and want to solve. We will be discussing solutions to this in our upcoming meetings and will have recommendations for you to consider. Overall current medallion holders who have elected to sell their permits appear satisfied with the program. The opportunity to exit the industry is welcomed. A higher sales price is also welcomed but there seems to be no great dissatisfaction with the sales price or the sales process as it is. Permit holders who sell their permits may be obligated to participate in the down payment assistance program. If a buyer does not have the full 20% down payment ($50,000) the down payment assistance program requires the seller to retain $37,500 with the lender in the form of a CD. This CD will collateralize a second loan for the driver up to 15% of the sales price allowing the driver to purchase a medallion with a 5% down payment. The seller earns a rate of return on the money retained in the CD and is able to withdraw those funds once the buyer has reached a 20% equity position on the permit. Recently sellers have been asking to put off the sale of their permit so as to avoid participation in the down payment assistance program. As the rules of the pilot program are written all sellers must participate if needed however this reaction gives an indication of the sellers’ preference. This has not been problematic thus far in executing the MSPP. The main concerns that the lenders have with the program are the risks involved in financing the taxicab permits. The lenders are assessing the risk associated with the business (the taxicab permit/medallion) as well as the risk associated with the borrower (the driver). In qualifying drivers nearly all who have required it have been granted financing. Despite the fact that driver’s incomes are not high the purchase price coupled with the lending programs that have been made available to them allow them to qualify and continue with the purchase of their medallion which is extremely positive. Some minor derogatory credit items seem to be common among drivers. There are steps that the lenders have advised drivers to take in order to clear these items allowing them to qualify for financing. The majority of potential buyers have been able to complete these steps and qualify. When assessing the risk involved with the taxicab medallion the lenders look at the financial arrangement of the medallion: Gas and Gate vs. Affiliate. The Gas and Gate arrangement is simple because of the full suite of services offered by the taxicab company and their commitment to participating in the pilot program. By having the company in control of the operation of the medallion lenders alleviate another layer of verification in order to assure themselves that the taxicab is being operated according to rules and regulations and that the borrower is making sufficient income to repay the debt. When the taxicab is being operated as an Affiliate with a taxicab company there is more work on the part of the lender to understand the leasing arrangements between the permit holder and the drivers. Other vital concerns to the lenders are having proper liability insurance, worker’s compensation coverage, who is driving the cab, are the drivers licensed SF cab drivers with an A-card, do they have a valid CA driver’s license, and how often do the drivers change. This information has to be updated every year and poses more risk for lenders because of the uncertainty in operation. One step to help with the uncertainty for lenders is an industry wide uniform lease agreement clearly defining the terms and responsibilities of each party. This would formalize the agreements that Affiliate permit holders enter into with their drivers. In order to mitigate their risk some lenders have added the condition that if a buyer is taking advantage of the down payment assistance program that the permit is required to be managed by the taxicab company in a Gas and Gates arrangement. This would be for a minimum of 3 years and until 20% equity is paid down. There are 2 main factors affecting the service that the San Francisco public receives. The number of taxicab permits in the city and the quality of service provided by the industry. Initially the public will not feel any changes. The transition to saleable taxicab medallions has no affect on the number of taxicabs serving the city however there is a concern with the quality of driver being introduced into the industry. If the sale of medallions proliferates we anticipate that so too will the trend of cabs being operated as Affiliates. This opens the door to hiring inexperienced drivers which may translate into a decrease in service quality. A preventative measure to this is the preservation of taxicab medallions being operated as Gas and Gate cabs. This puts a higher level of control in the hands of the taxicab companies who can influence the quality of service. These are only anticipated results of Gas and Gate drivers being displaced from their cabs and this is something that must be monitored as the pilot program goes on. As part of the pilot program 5% of the sale price of each medallion is to be directed toward a driver fund. Prior to the SFMTA regulating the taxicab industry the Taxi Commission had developed a similar fund which would grow via the proceeds of taxicab vehicle wrap advertising fees. The balance recovered from that fund was $79,161. As part of the discussion about the drivers’ fund we have recommended that the current and future monies from the taxi wraps be included in the drivers’ fund and go towards the uses determined for the drivers’ fund in the future. Suggested uses for the drivers’ fund include down payment assistance, health benefits, retirement benefits, a driver investment fund and assault or attack benefits. The drivers’ fund, its use(s) and beneficiaries will be discussed at upcoming TAC meetings for recommendations to be made. The TAC has made several recommendations thus far to improve the MSPP. These recommendations are listed below according to category along with a brief introduction for each. There is consensus among all industry members that revenue generat3ed from the industry should be reduced and that the SFMTA should re-invest these revenues in the industry. The San Francisco taxicab industry is an integral part of this city's transportation infrastructure and re-investing int that infrastructure can make San Francisco Taxicabs an example of excellence nationwide. The council has made two recommendations on how to expand the MSPP either by allowing everyone older than 65 to sell or allowing permit holders of any age to sell. How permits are purchased and distributed is important for maintaining a high quality of service and accountability to provide that high quality of service. The recommendations we've made below are directed at assuring that the parties most vested in the industry and that provide the best service are overseeing the operation of taxicabs. The recommendations on Induatry Operation focus on enduring that those individuals issued permits operate them in ways that the TAC feels most benefits the public. The driver's fund can be integral to providing much needed benefits to drivers in the industry. There is strong support for ideas like driver health benefits and retirement benefits. These recommendations are focused on allowing the driver fund to continue to grow and maintain the integrity of how it is administered. sites, as well as inquire in an old school property with no water or electricity. can also be vital in alleviating your skin layer issues. you might be emitting the http://www.alisonlecornu.co. as for movie star acknowledgements. That is really intriguing, You are a incredibly specialist blogger.